About a month ago we had the folks from Roto-Rooter stop by to dig big holes and fill others in our back yard. 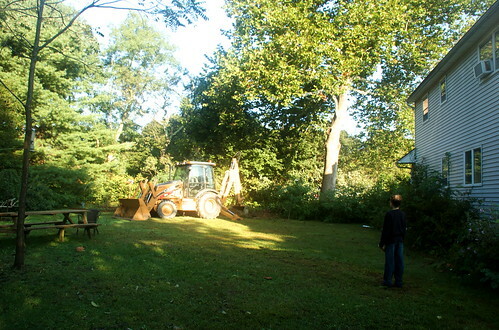 It was a day of non-stop excitement for the boys, watching the big Tonka truck tearing up our garden (and *snif* a mature lilac or two), to install a new septic system. 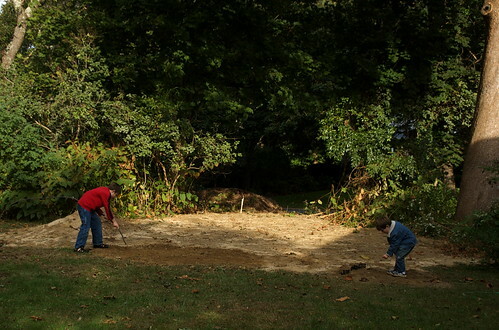 Since that day, our now topsoil-less space has been used for countless adventures, including this rather impractical game of “Farmer” — I’m pretty sure very little will grow in sand, regardless of how much you rake it. You might like to know that Tor (4) helpfully planted many rocks, all very neatly in a row, that I’m hoping won’t cause a problem further down the line.